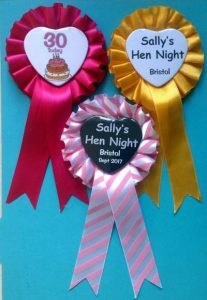 Make sure your hen party stands out with our wide range of bride to be and personalised hen party rosettes. 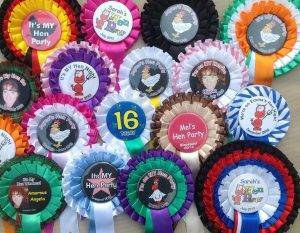 If the other members of your party are wearing badges then we can customise the bride to be so that hers reads something like ‘It’s my hen night’ and use the same colours as the other people’s badges. Of course you could also decide that everyone needs a rosette, in which case we can always put an extra tier of ribbon on the Bride’s. We always carry a good supply of different coloured ribbon so we can customise your hen party rosettes with any combination of colours for the various tiers of the rosette. If required we can also print the tails on the rosette. If you are undecided on the type of design that you require then we have a great selection of suggested designs which you can find by following the links below. To make it easier to handle the large number of designs, we have grouped them in to categories. Of course these designs are not the only ones that you can have for your rosettes. If you wish to create your own for your hen party then you can always send us details, or if you want to combine the elements of several of our suggested designs then all you need to do is send us an email and tell us which elements of which badge designs you want us to use.